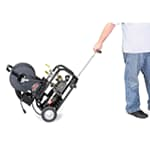 Home » How-To Library » What's a Jetter? There are many different products on the market designed for clearing a clogged drain, from the glorified plastic zip-ties to chemical drain cleaner, but many of them are ineffective at clearing the clog. 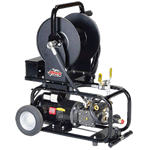 If you've tried several products on the market, and you're still left with a slow drain, there's one great piece of equipment that will clear any pipe blockages you encounter - a jetter. A drain jet uses high-pressure water to move through pipes and break away buildup. One high-pressure stream of water is directed forward to clear the path while multiple high-pressure streams are directed in a reverse angle to propel the jet forward while also flushing debris backward. The style you choose should be based on whether you'll use it indoors or outdoors. For using indoors, you should choose an electric jetter. They're lighter weight, slightly less expensive, and most importantly, safe for indoor use. 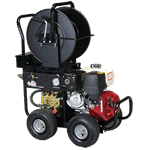 You do not want to use a gas jetter inside your home or garage, because it will give off poisonous carbon monoxide. If you plan to be running it outdoors to clear sewage lines of grease, sludge, sand, or ice, your best bet will be a gas jetter. This will give you the power and mobility to clear tougher piping without needing an outlet. What's a Jetter?.. Our Power Equipment Direct how-to library can help you learn about Proposition 65 Product Labeling, Sales Tax Information and Product Recalls for Pressure Washer Equipment.